Rethreading and Stabilisation extending the life cycle of your Road resurfacing. 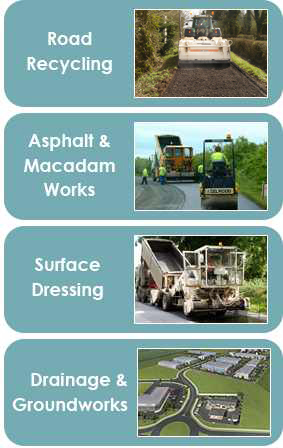 At Callington we have over 10 years expertise in extending the life cycle of Road resurfacing projects. The Rethreading and Stabilsation process can involve the in situ mixing and addition of bitumen emulsion. This provides additional stiffness and durability to the aggregate layer, resulting in a more durable road surface. - The existing surface is broken up with modified Bitelli Planers or Wirtgen crushing machine. - This is then followed by a second pass, by a Merri crusher or Wirtgen which leaves material suitable for optimum compaction. At this point in situ mixing of bitumen emulsoin, can be carried out. this provides additional stiffness to the aggregate layer and results in a more durable pavement. - Grading is carried out by highly competent, experianced operators using mothern grading machines. - Finally surface sealing is carried out by applying double surface dressing. Callington uses a fleet of mothern surface dresing equipment including extendable spraybars and self-propelled, extendable phoenix gritters. Ballykillmurray, Tullamore, Co. Offaly Copyright © 2018 Callington Ltd.